Explore the ocean floor of this no download 5 reels game and find out more about the underwater life using all possible 243 ways. Here you will get not only adrenaline buzz, but also you will receive inimitable bonus features to increase your money prizes. So, don’t linger! 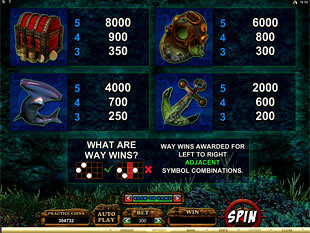 Just become a scuba diver and plunge for dizzy Free Spins and Multipliers here. You should be careful because this profitable world is marvelous and at the same time dangerous. Here you can meet different curious inhabitants of this underwater kingdom as hammerhead sharks, moray eels and others that award you attractive benefits and certain money prizes. But also here you can meet cute and magic Baby Octopus that is a wild symbol and thus presents you some special advantages. This little underwater creature appears only on the reels 2 and 4. So, catch this shining ocean inhabitant and it will replace any other symbol to finish or complete your winning combo. Moreover, manage to collect two wild symbols at once and you will trigger adventure the Kraken Feature, where you can gain overwhelming prizes! Are you going to take away the biggest winnings? And that is really easy at Octopays. Here you will find very useful and simple paytable, because there you can view all possible prizes as in coins, so in cash with a current stake. So, just set and correct the size of your bet, which can be from only $0.30 and up to $3.00 per spin, to gain any winnings. But in case you want to hit the most attractive money prizes you just should bet all possible 300 coins and you will get the chance to win the top jackpot of 8,000 coins by collecting five Chests with Gold! Are you ready to dive into the unknown for breathtaking treasures? Then just try to avoid killing tentacles of giant kraken that hides in the dark deepness…But also you can meet with this squid and win huge money. So, if you are brave enough then collect two Baby Octopuses to activate the Kraken Feature. 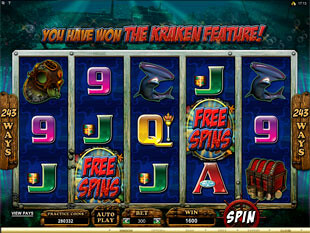 Here you will get unbelievable 12 Free Spins and also one additional special symbol, as well as uncommon benefits. Thus, before each new free spin the giant tentacles of kraken will place up to 4 wild symbols of Baby Octopus anywhere on the screen, except the reel 3, because there you will get extra Moray Eel. This ocean creature can also replace any other symbols of the game, but Baby Octopus, and in the way double your prize. Moreover, in case Moray Eel lands on the third reel and at the same time you get the winning combo containing Baby Octopus that inks itself, then your wins will be also doubled! So, play and win dizzy money here. But note that, unfortunately, the Kraken Feature can’t be re-triggered. Thus just return to the basic game and hit two wilds again! 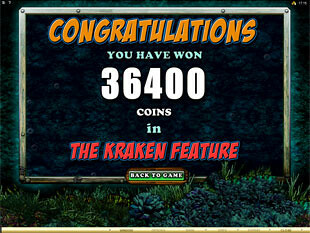 Hurry up to the unexplored ocean floor and make sure that to win here is pretty easy. 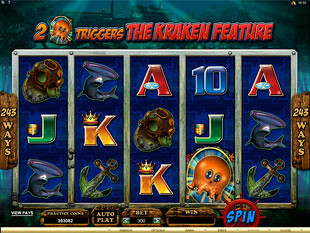 Add bright colors and fresh emotions to your everydayness with Octopays Slots Machine. Here you surely won’t be bored, so don’t linger and click “Spin” button to dive into this lucrative and deep ocean of money prizes! More free spins and other tempting offers are waiting for you here.